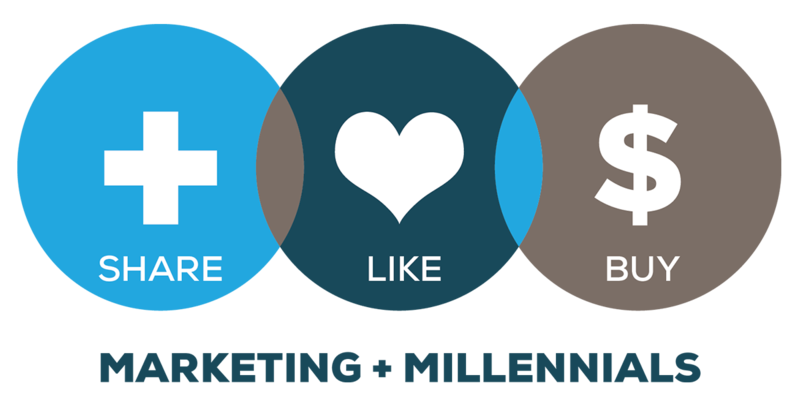 Millennials are about three times more likely than other generations to reference social media networks when making purchase decisions, according to a 2014 study by Market Strategies International. While most consumers today use Facebook for making decisions about purchasing, millennials are 19 percent more likely to use Instagram and 14 percent more likely to use Tumblr than any other generation. The social media environment also allows for significantly more crowdsourcing and input from friends and networks. 84 percent of millennials reported that user-generated content on a company’s website has at least some influence on what they buy compared to just 34 percent of boomers who rely on user-generated content when making a purchase decision, according to a study from Bazaar Voice. Millennials also went so far as to report that there were some purchases they would not make at all without first reading user-generated reviews or engaging with user-generated content. This represents a huge shift in the marketing space – one that is more reliant on consumers as brand ambassadors as opposed to the brands themselves promoting their own products or services. A study by the McCarthy Group found that 84 percent of millennials don’t like traditional advertising nor do they trust it. “The study reinforces the dynamics of the sharing economy and how strongly this consumer group relies on online news reports, friends, social media and even company websites as trustworthy sources of information,” said Tami McCarthy, founder and CEO of The McCarthy Group. The key to winning millennial trust is for brands to figure out how to persuade other millennials to deliver their messages. One way to do that is to involve millennials in the creation process of the marketing strategy. This involvement takes place in a variety of different channels – especially in the digital social space. As a result, brands must keep up-to-date with the changing preferences of millennial social media users. Take Facebook, for example. As soon as baby boomers embraced the social media site, millennials became more connected with Instagram, Snapchat and Twitter. The overwhelming takeaway is that millennials are nothing like the boomer generation who shopped in a more linear process and with Consumer Reports or the Kelly Blue Book. The collision between the digital and physical space is creating a new environment where there are dozens of influencers on a millennial purchase decision. The key is to break through the noise and reach the right millennials, in the right place, with the right message. – Make sure you are being relevant – Real time is great. But right time is what could be the difference between building a strong call to participate versus just a call to action. – KISS – Keep it simple, stupid. You learned it in business school and it is still true today. Don’t bore your millennial social media mavericks with long drawn out messages. – Focus on your influencers to build their networks – Social media marketing is quickly relying more heavily on influencer engagement. Identify your biggest brand fans and develop ways to help them spread your message. – Stay true to you – If you are not meant to say bae, don’t. Just because everyone else is doing it doesn’t mean you should too. Identify your brand’s voice and stick with it.